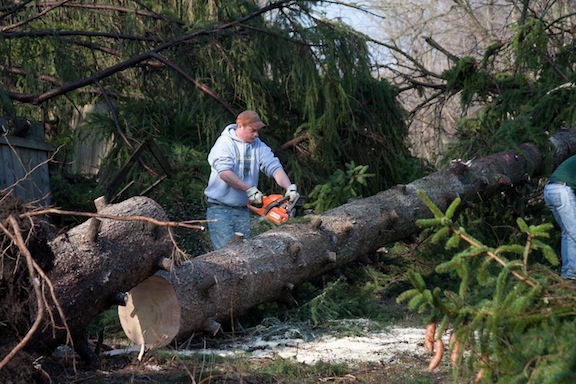 Posted on Fri, Mar 16, 2012 : 6:45 p.m.
A worker from Simply Green landscaping company of Ann Arbor on Friday uses a chainsaw to cut up one of three large pines trees downed by the storm at a house in the 7700 block of Huron River Drive in Dexter. All three trees fell away from the house. About 2,700 DTE Energy customers in the Dexter area remained without power and at least two roads were closed as evening fell Friday in the aftermath of a powerful tornado that swept through the area Thursday. DTE expected most people to have power restored Friday night but said some would likely remain without power. Spokesman Scott Simons said it was not clear when any remaining customers would get their power back. Simons said DTE had to replace 50 to 60 poles taken out by the storm in the Dexter area. Dexter-Pinckney Road between Island Lake Road and N. Territorial Road and Wylie Road between Island Lake Road and Dexter-Pinckney Road in Dexter Township are closed due to storm clean-up and utility repair work. All traffic except emergency vehicles and residents who ive on that section of roadway are prohibited from traveling those roads, according to information from the Washtenaw County Road Commission. Dexter-Pinckney Road is expected to be closed until March 22, according to a message sent out by the Village of Dexter. The detour for this temporary road closure is Island Lake Road to Dexter Town Hall Road to N. Territorial Road. The village also said it would begin debris collection in affected areas of the village Friday evening and continuing through the weekend. Residents were advised to keep sidewalks and streets clear. The village said residents should assume all downed power lines are “live” with electricity. If you see a downed power line that is not being serviced by a DTE crew or smell gas please call 1-800-477-4747. The village said all calls regarding village services (including water, sewer, tree repair, sidewalks, streets, and flooding) to 734-426-8303. Questions regarding township services should be directed to 734-475-2628 or 734-260-5875. An emergency shelter had been set up at Mill Creek Middle School on Dexter Ann Arbor Road and hotels were offering discounted rates for people displaced from their homes. Wed, Mar 21, 2012 : 6:23 a.m. Sat, Mar 17, 2012 : 1:27 p.m. Sat, Mar 17, 2012 : 12:38 a.m.
Oh thats real professional there Mr Simply Green. No eye protection and an unsafe technique. Are these guys even licensed or insured to be doing tree removal? Sat, Mar 17, 2012 : 2:33 p.m. In addition to eye protection and unsafe technique, he should have on a full face shield, chaps, long sleeves, proper non-slip gloves, ear protection (he could have earplugs I guess) ... A great example of how NOT to use a chainsaw. This is why it's imperative that as a homeowner you NEVER hire anyone without a) seeing if they are licensed if required for their profession, b) ensuring they have workmen's compensation insurance (get a copy of proof), c) ensuring they have liability coverage (get a copy of proof), d) they obtain permits, if required, for the work to be done.